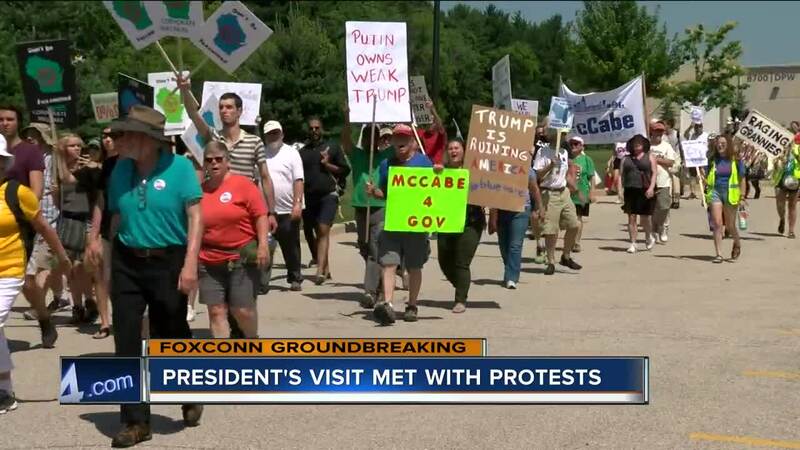 Thursday was a busy day of protests in Southeast Wisconsin. Starting at 8 a.m. downtown Milwaukee, Voces de la Frontera organized a group to meet at Zeidler Union Square to protest the President and immigration. About 100 people marched to the Pfister where President Trump was attending a fundraiser. They blocked streets out front and then headed towards the Third Ward where they blocked traffic at an I-794 off-ramp for more than an hour. “I’m here because families are being separated and I’m here for my people,” said Brian Verdin, downtown Milwaukee protester. “Donald Trump is here and in the midst of everything that’s going on the immigration system and the way that they’re treating families,” said Maya Neal, downtown Milwaukee protester. Around noon, hundreds more gathered at Smolenski Park in Mount Pleasant to protest the Foxconn groundbreaking. The crowd was full of people representing more than 40 groups with environmental, economic and political agendas. The group marched to Village Hall around 1:30 p.m. where they listened to speakers and chanted for another couple hours. 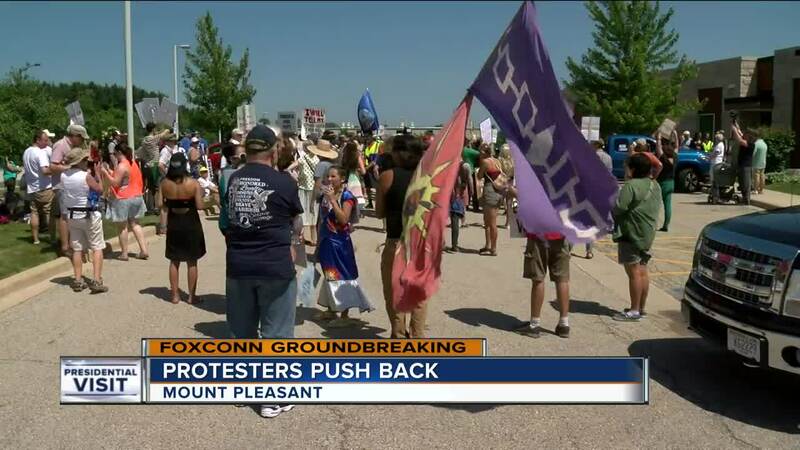 “To demonstrate the fact that we’re not going to let something like this come in and continue to go and demonstrate so much political corruption in our state,” said Lee Stedman, Mount Pleasant Protest Organizer. “I’m very concerned about the environment effects of this new company that’s coming in,” said Bernadette Borcher, Mount Pleasant resident. “Just be the voice of young people in the state for this issue we’re going to be taking on the burden for a couple of decades now because of this project Scott Walker is pushing through,” said George Olufosoye. Mount Pleasant residents Jim and Kim Mahoney might lose their home to Foxconn. The Village has told them to be out by August. “We have been trying to sell our property to the village since October. They will not even consider our offer,” said Kim Mahoney, Mount Pleasant Home Owner. “I’m just gonna keep living there until they give us enough money where I can rebuild a new house in a similar type location,” said Jim Mahoney, Mount Pleasant Home Owner. The couple said protesters brought them some hope on a day that could have been otherwise difficult. Protesters wrapped up around 4 p.m.